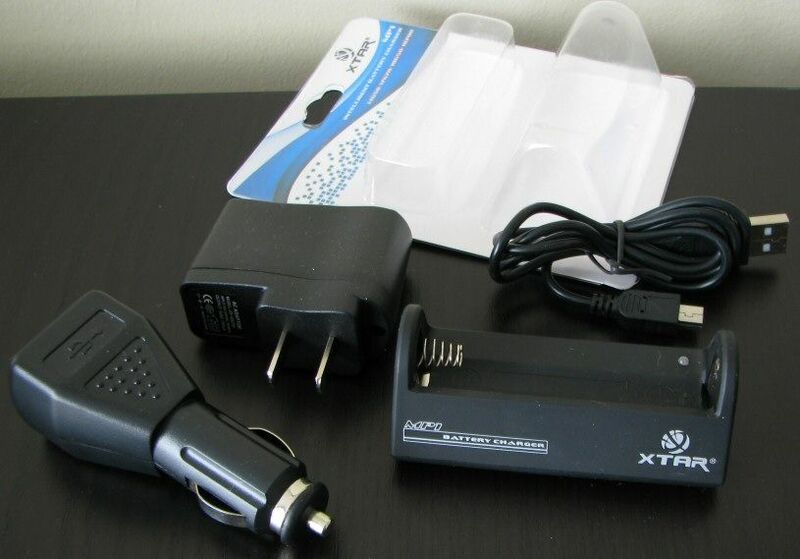 I have been asked to review a couple of new Li-ion battery chargers by Xtar. Although I don’t have the experience or expertise of others here, I’ve agreed to compare them to the 3 chargers I keep on hand for regular use: the standard Pila charger, the classic DSD charger, and the basic-model Cytac/HXY/DealExtreme.6105 charger. For more info on chargers in general – and some excellent detailed comparisons – I recommend you check out the excellent mdocod’s consumer Li-Ion cradle charger roundup review. 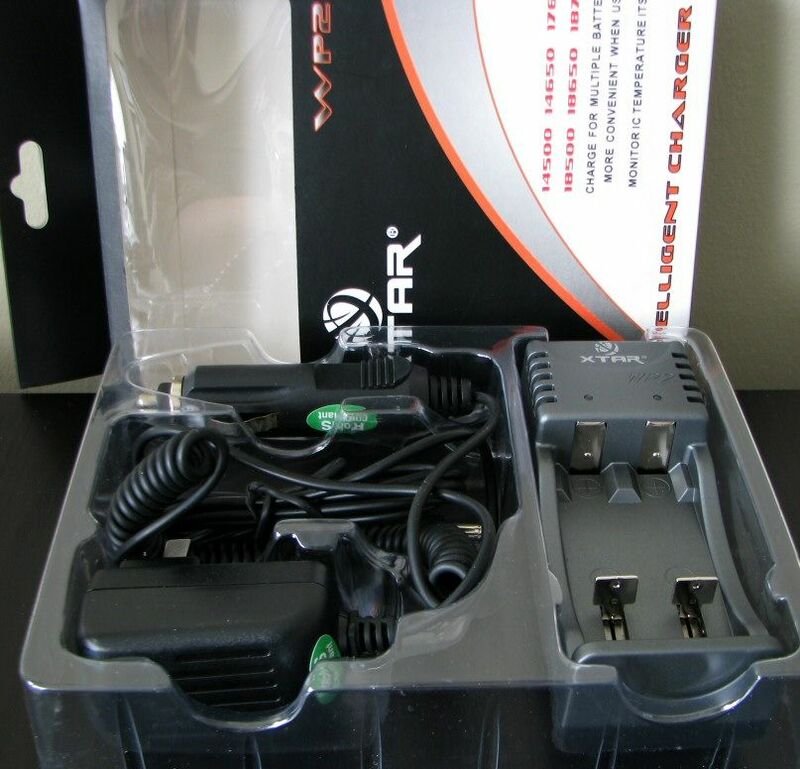 The WP2 comes with both standard AC power adapter and DC car adapter. The cabling and overall build seem reasonably good (good length on the cables, reasonably solid, etc.). 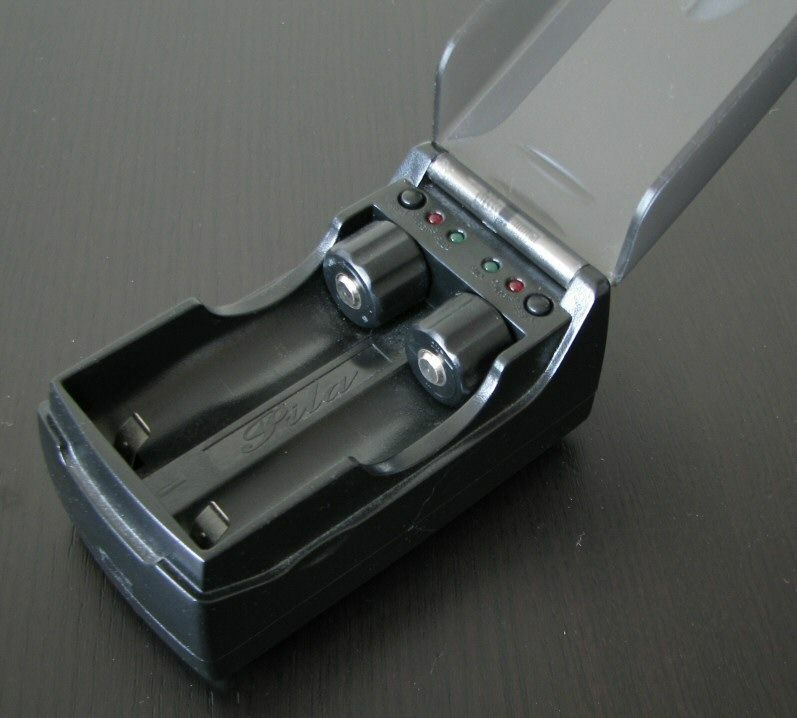 The battery trays are spring-mounted, and can easily accommodate any size from 14500-18650. The MP1 is a much simpler package, consisting of the charging base and a short standard micro-USB/USB charging cable. Given the permanent negative terminal spring, a ~65mm height cell would be needed (e.g. 18650, 14670, 17670, etc.). Also included with my review sample were a USB to AC adapter and USB to DC adapter. Note that the bundled USB cable length is rather short. But since it uses the standard micro-USB connector at the charging cradle end, you should be able to use a longer one from one of your other devices (e.g. camera, blackberry, etc.). I note that the specifications for the two chargers seem similar – but the MP1 also specifically notes that the charger will monitor the cell once fully charged, and maintain a low 4uA charging current. I have heard similar claims made for the WP2, but don’t see that on their spec sheet. 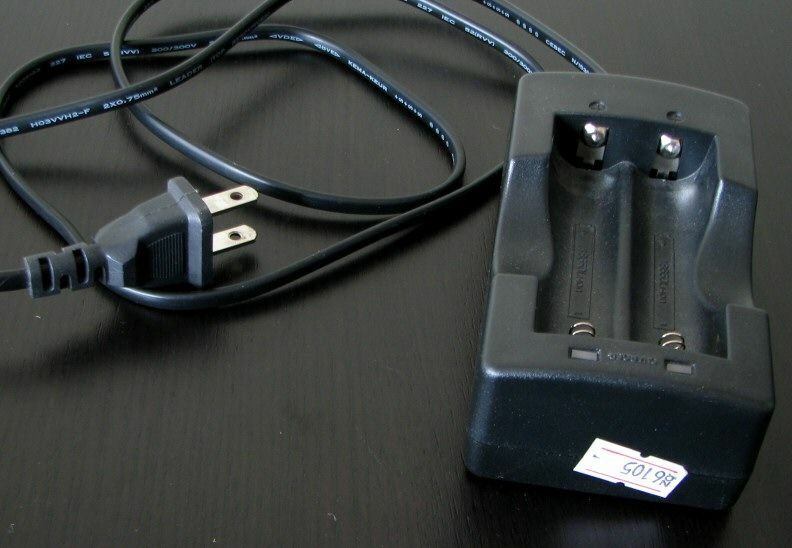 The Pila charger is probably the “standard” by which all Li-ion chargers are judged. Well designed, it uses a proper Constant-Current/Constant-Voltage charging regimen with proper termination (i.e. current shuts off once the cell reaches full charge). Features two independent channels. You can also top-up your nearly-full cells by manually forcing a charge (i.e. most chargers won’t charge cells that exceed ~4.0V). With the bundled spacers, you can charge everything from 14500 and up. Although the Pila will also charge 16340 (RCR) with additional spacers, this really isn’t the ideal charger for them (i.e. the charge and cut-off current may be a bit high for them). However, the Pila should be reasonably safe on RCR thanks to its “intelligent” charging algorithm. Despite appearances, this is actually a single-channel charger (i.e. it is wired for 2 cells in parallel, for simultaneous charging). Simple and basic, it is fairly popular for its Constant Current charging method, followed by true termination (i.e. no trickle charge). Main drawback is its slow rated charge rate (~350mA). Although capable of charging at a higher rate, it lack any sort of Constant Current or Constant Voltage charging method, and doesn’t terminate at the end of a charge (i.e. just slowly drops off in charge, even after the light goes green). It does feature two independent channels, though. To compare the performance of the chargers, I have directly monitored their charging currents with a data-logging DMM. I have used the measuring method described by HKJ in his excellent Measurement on flashlight overview, for measuring charge current on Li-ion chargers. 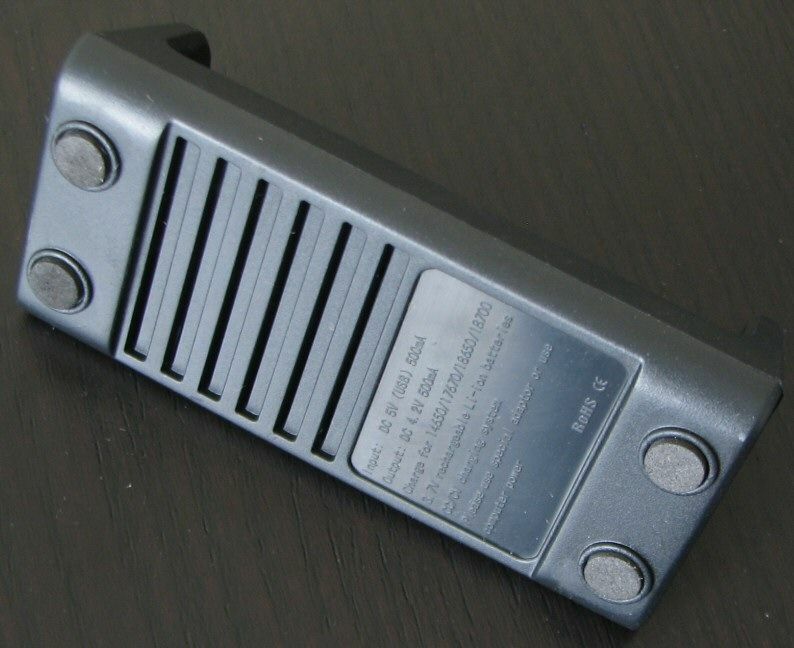 For these tests, I have used one of my standard AW protected 18650 (2200mAh) cells. To deplete the cell, I used my regular test bed of a fullty-regulated JetBeam Jet-III IBS on Max output – and wait until the cell’s protection circuit gets tripped. The cell is then immediately loaded into the charger for testing and recording (i.e. depleted resting voltage <3V). The graph below is complicated, so let me walk you through each trace. First off – a note about the early termination on three of the chargers (i.e. ~4.15V on the DSD, WP2, and MP1). I believe this is due to a combination of effects – notably the age of the cell used in testing (one of my “retired” 18650s with a lot of charging cycles on it), and the presence of the DMM in the charging path. Even though this setup has a relatively low impedance and a low voltage drop, it still seems to confuse the charger termination when older cells are used. In all three of these cases, when I re-inserted the cell without the DMM, the charging light went red again, and continued until ~4.18-4.19V resting volts. But if I reconnected with the DMM in place, the light stayed green and wouldn’t charge further (strongly suggesting the DMM plays a role in the issue). Testing further, I noticed these three chargers were variable in their termination points even without the DMM in place. Basically, new cells all terminated ~4.18-4.19V resting volts. But older cells, with a lot cycles on them, terminated anywhere from ~4.13-4.16V resting volts. In each of those cases, re-inserting the cell caused charging to continue (although not necessarily all the way up to 4.19V resting volts, depending on how old the cell was). DSD charger: The DSD charger has a fairly constant charging current - ~0.35A at the start of my run, slowly dropped to ~0.30A when the light went green and it terminated the charge 5+ hours later. Note the early termination in my tests (explained above). 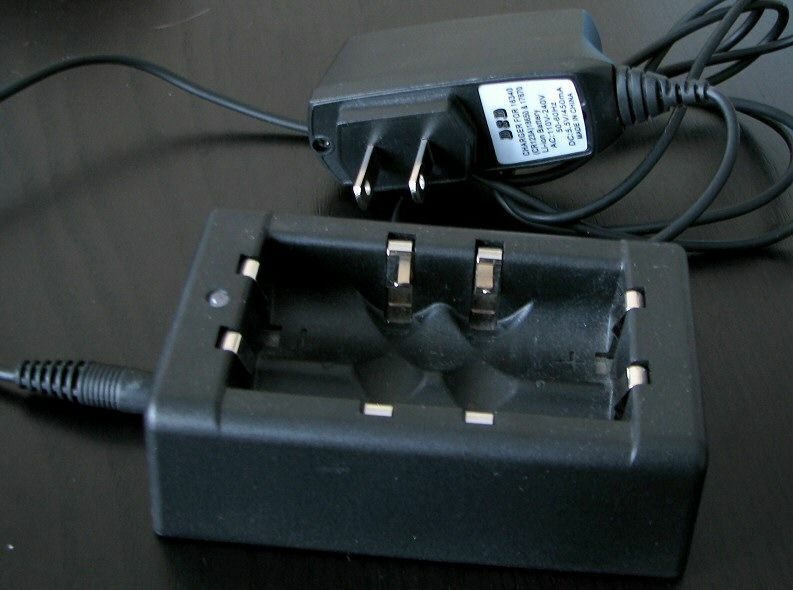 DX.6105 charger: The DX.6105 does not use a constant-current method, but simply starts at a high current and gradually drops off (mine started just over 1A, although some have reported lower initial currents, e.g. ~0.75A). Note that the unit does not terminate once the light goes green, but continues to charge at a low rate (140mA and dropping, in my case). This is NOT recommended – 140mA is still a lot of current, and you will quickly over-charge your cells if you do not IMMEDIATELY pull them out of the charger. This is really bad on Li-ions. :shakehead: 10mins after the light went green, resting voltage was 4.21V on my sample. My main concern here is the relatively high charging rate at the time of termination (i.e. >200mA). That's pretty high, and wouldn't be the best for smaller cells with lower capacity. So while you could fit RCR (16340) in the WP2 with a standard length spacer, this is not the ideal charger for these cells. 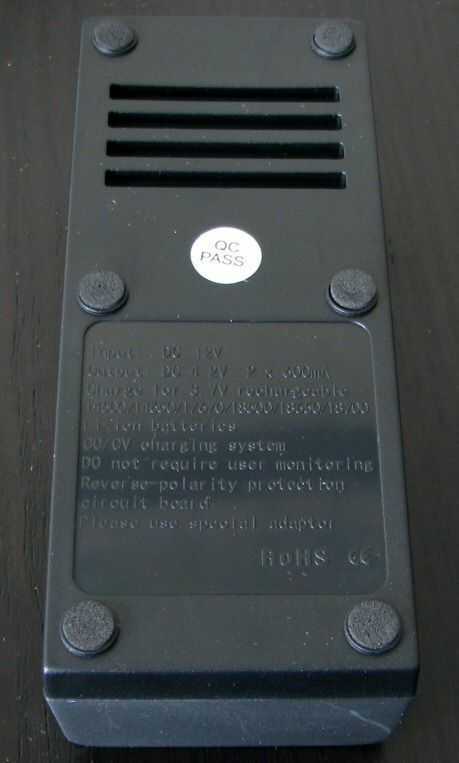 WP1 charger: The WP1 starts off at its rated 0.5A charging current. But it doesn’t seem to be a proper CC/CV charger as claimed. Rather, the charging current drops off to around 0.45A reasonably quickly (over ~10 mins or) and then seems to level off at that level for about half an hour or so. Then the charging current starts to drop off at an increased rate – in fact, it appears to just slowly decay over time, until it reaches a fully charged state. :shrug: Like the DSD and WP2, the MP1 showed early termination on my older 18650 cell (see note above). At the point when the light goes green, the current drops to an ultra-low 5.6uA. This is consistent with what Xtar reports for the MP1 – i.e. drops to a low current (4uA claimed), while it continues to monitor the charge state of the cell. It will supposedly then periodically increases the current, to keep the battery fully topped-up. Up to you if you want such a feature, but this ultra-low uA current shouldn’t be a problem. 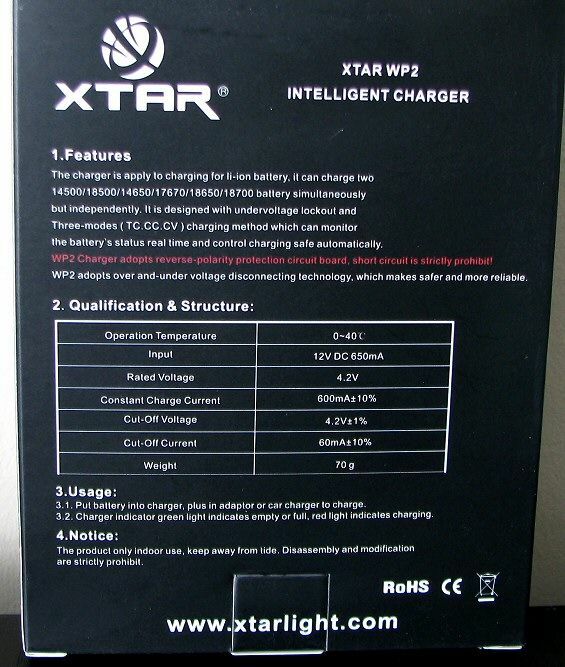 From my (limited) perspective, the Xtar WP2 seems like a pretty good “poor man’s” Pila, (although it lacks the Pila’s ability to force a manual charge). Overall performance and the charging algorithm seem very similar. For the estimated street price of ~$20 (shipping included), you certainly get decent value for your money. Definitely much better performance than a lot of the cheap “trickle”chargers out there! The MP1 doesn’t live up to its claimed CC/CV charging method, but the overall performance is reasonable for the price point of ~$10. You also have the option of running off USB, AC or DC power. Note that I never recommend running a sustained charging system off a computer’s USB port – best to stick with AC/DC power. As such, I’m glad to see the adapters included on my sample. 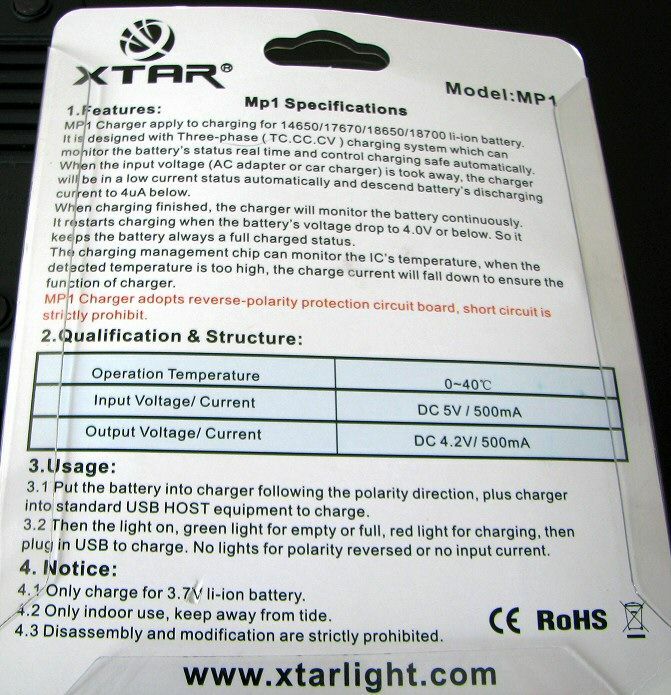 UPDATE Jan 26, 2010: To allow you better compare the Xtar chargers, below are direct comparisons of the charging current vs charging voltage for each charger, on the same battery (a well-used AW 18650 2200mAh). The blue scale on the left is the charging current, the purple scale on the right is the charging voltage. As expected, the WP2 shows periodic dips in the charging voltage every 2-3 secs (i.e. just like you see for the charging current). The magnitude of the voltage deflection is a lot less though - I never saw more than ~70mV variance from expected. Once the light when green and the charger quasi-terminated, the voltage dropped to the resting level of 4.14V. The voltage trace of the MP1 is about what you would expect. I don't know what algorithm the charger is using exactly, but there were no unexpected major jumps/dips in charging voltage. Thanks to the low (<70mA) charging current when the charger terminated, there's no significant change in the resting/charging voltage (i.e. ends at around 4.15V). 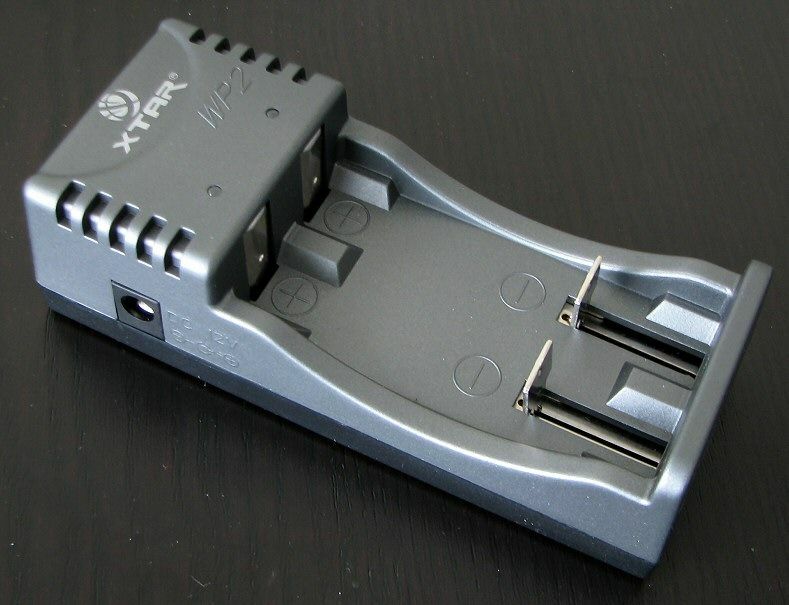 Xtar WP2 and MP1 provided by Xtar for review. All other chargers were personally purchased several years ago.